Latest news is that as of 23rd November 2018 NICE have recommended thrombectomy out to 24 hrs based on current evidence. This is likely to increase the need for CTA and perfusion studies and the resulting numbers eligible dramatically. Limitations are still on the recrutiment and retention of INRS in the UK. A list of UK centres can be found here where thrombectomy is available. Evidence exists for internal carotid artery terminus and M1. Carotid ‘‘T-lesions’’ have the poorest outcomes among anterior-circulation strokes. Proximal M1 occlusions have worse outcomes than distal M1 occlusions as a result of occlusion of lenticulostriate arteries with basal ganglia infarction and increased risk of reperfusion haemorrhage. Basilar artery occlusion was not included in the recent trials and has a dismal prognosis if untreated and the clear improvement associated with recanalisation as sufficient grounds to treat. 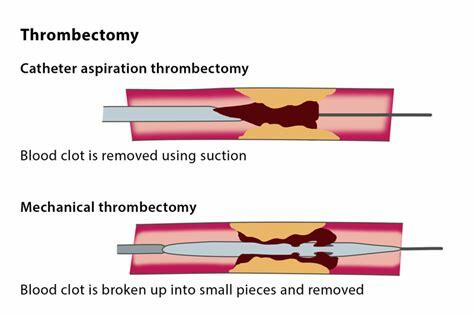 Different methods of removing thrombus. The exact criteria is the presence of salvageable brain. There is evidence of benefits out to 24 hours in selected patients supported by perfusion studies. Although most of us would consider M1 and ICA large vessel occlusions as the primary indication it is reasonable to consider M1/2 and even ACA and PCA if there is a significant deficit and evidence of a mismatch where there is a fall in CBF and the CBV is normal. Each case must be based on its merits. The outcome for basilar artery stroke is so poor that many of us would have a very low threshold for referral and the window is again up to 24 hrs on a case by case discussion with perfusion imaging. The thrombolysis in cerebral infarction (TICI) grading system was described in 2003 by Higashida et al 1 as a tool for determining the response of thrombolytic therapy for ischaemic stroke. In neurointerventional radiology it is commonly used for patients post endovascular revascularisation. Like most therapy response grading systems, it predicts prognosis. The original description 1 was based on the angiographic appearances of the treated occluded vessel and the distal branches. In 2013 Fugate et al reported marked variability in its definitions and application. A consensus paper from three collaborative groups published in Stroke in 2013 3 recommended a modified scale, and a change of name from Thrombolysis in Cerebral Infarction to modified Treatment in Cerebral Infarction (mTICI), to better reflect the increased use of endovascular therapies. The goal is that at least 70% of patients should have mTICI grade 2b/3 (ie, > 50%) reperfusion for all clot locations. Mechanical thrombectomy (MT) is a procedure performed in the setting of an acute ischaemic stroke. The operator gains access to the cerebral circulation usually via the femoral artery in the groin and gains access to the cerebral circulation.The catheter is advanced over the wire from the femoral sheath. It passes via the ascending aorta and into the cervical vessel of interest. Once in place the guidewire is removed and a fine microcatheter is placed in the guide and advanced into the relevant vessel. all of this is done whilst using flouroscopy with biplane anteroposterior and lateral flouroscopy. Radiopaque contrast is injected to delineate the vessels and anatomy. Using specialised kit the operator can remove an occlusive thrombus from the proximal MCA. There are two devices stent retrievers and suction thrombectomy. The newer studies all used stent retrievers that expand across the clot which can then be removed. Suction catheters alternatively can aspirated clot into the device and therefore removed. This allows flow to be recommenced in the obstructed artery. The goal of thrombectomy is to achieve a complete recanalisation (TICI grade, 3). It may also be used on other large vessel occlusions such as Basilar artery thrombi. Mechanical treatment approaches for acute ischaemic stroke treatment aim for fast and efficient reperfusion with short procedure times and high recanalisation rates, thus extending the treatment window. MT may be used with or instead of IV Alteplase. The patient is brought into the angiography suite and checklists are run through to ensure right patient and procedure. It is not clear if the procedure should be done under sedation or under general anaesthesia and both have their indications and contraindications. Many patients tolerate the procedure well. For some who are agitated general anaesthesia can be instigated. Access to the femoral artery is obtained and the INR (Interventional neuroradiologist) gains access to the internal carotid and circle of Willis. A microguide wire is passed into the clot. Aspiration is often tried to retrieve a thrombus under negative pressure. If needed a stent retriever can be slid over the microcatheter to emerge inside the clot and used to extract the clot. Difficulties and challenges arise when there are tandem occlusions of the internal carotid artery and intracranial vessels or a fixed intracranial stenosis, which can limit endovascular access. The procedure often takes an hour. However I have seen clots taken out within 5-10 mins of the procedure starting when in expert hands. Over recanaliation rates can be up to 80%. There are mixed opinions on whether patients need to have simple what is called conscious sedation or general anaesthesia during the procedure. There are arguments for and against both. General anaesthesia can cause hypotension and time delays however it is useful for agitated patients. General advice is to manage case by case. Patients need continual pulse oximetry, capnography as well as monitoring of usual observations. Oxygen is given if needed to maintain sats > 92%. Monitoring staff need to watch out for pain at the groin puncture site which needs inspection. They also need to be aware of any abdominal pain, any hypotension which may suggest bleeding in addition to the usual acute stroke management. Initial checks are every 15 minutes and then every 30-60 minutes for up to 6 hrs post procedure. Pseudoaneurysm formation may occur if haematomas expand. An USS is the imaging of choice. manual compression of the site may be enough to cause thrombosis. If there is suspected retroperitoneal or pelvic bleeding then CT is the modality of choice to show acute blood. The powerful evidence for thrombectomy came out in early 2015 and was ground breaking and unexpected after several neutral trials. The implications for stroke services in the UK is profound and the NHS infrastructure contrasts with systems elsewhere. The UK has a significant lower number of doctors per head of population and even moreso when it comes to neurologists and other doctors involved in stroke. Stroke has major workforce issues and Brexit is not an incentive for highly trained European stroke and interventional neuroradiology specialists to want to work in the UK. There are different models of care for example the Finnish Helskinki model where there is a neurologist and trainee in the hospital at all times and their door to needle times are excellent due to a well-planned and thought out service. Their patients come from surrounding suburbs but others from 2-3 hrs away. The Irish model contrasts and patients come from across Ireland to the Beaumont Hospital in Dublin and then are returned to their local DGH. Only those with complications and other issues remain at the thrombectomy hospital. The UK model will likely be based around developing approximately 50 neuroscience centres. However, we are well short of the number of interventional neuroradiologists needed to support such an expansion. A Randomized Trial of Intraarterial Treatment for Acute Ischemic Stroke. Berkhemer OA, Fransen PS, Beumer D et al; the MR CLEAN Investigators. N Engl J Med. 2015; 372: 11-20. ESCAPE Trial Investigators. Randomized Assessment of Rapid Endovascular Treatment of Ischemic Stroke. Goyal M, Demchuk AM, Menon BK, et al; ESCAPE Trial Investigators. N Engl J Med. 2015; 372: 1019-30. Endovascular therapy for ischemic stroke with perfusion-imaging selection. Campbell BC, Mitchell PJ, Kleinig TJ, et al; the EXTEND-IA Investigators. N Engl J Med. 2015; 372: 1009-18. Stent-retriever thrombectomy after intravenous t-PA vs. t-PA alone in stroke. Saver JL, Goyal M, Bonafe A, Diener HC, Levy EI, Pereira VM, Albers GW, Cognard C, Cohen DJ, Hacke W, Jansen O, Jovin TG, Mattle HP, Nogueira RG, Siddiqui AH, Yavagal DR, Baxter BW, Devlin TG, Lopes DK, Reddy VK, de Rochemont RD, Singer OC, Jahan R; SWIFT PRIME Investigators. N Engl J Med. 2015; 372: 2285-95. Thrombectomy within 8 hours after symptom onset in ischemic stroke. Jovin TG, Chamorro A, Cobo E, de Miquel MA, Molina CA, Rovira A, San Román L, Serena J, Abilleira S, Ribó M, Millán M, Urra X, Cardona P, López-Cancio E, Tomasello A, Castaño C, Blasco J, Aja L, Dorado L, Quesada H, Rubiera M, Hernandez-Pérez M, Goyal M, Demchuk AM, von Kummer R, Gallofré M, Dávalos A, for the REVASCAT Trial Investigators. N Engl J Med. 2015; 372:2296-2306.